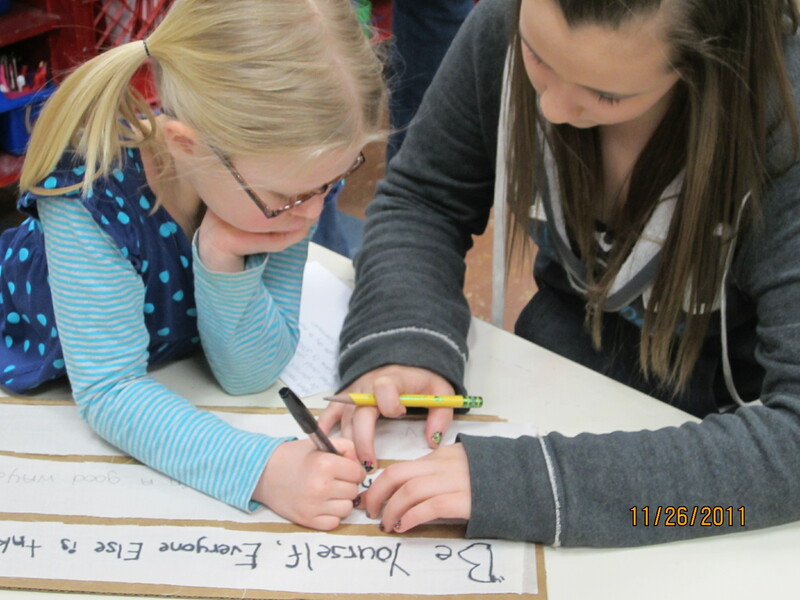 Today, sixth grade students partnered with their kindergarten buddies to begin writing messages of kindness and peace. Visiting artist Mrs. Housh read and discussed One by Kathryn Otoshi (check out our booklist page) with the class. The main message of the book is, “Sometimes it just takes ONE!” (to stand up for others). Students then worked with buddies to create their own messages. These fabric strips will be dyed during the next art session and will be combined with those from first grade and sixth grade. The fabric messages will be tied to the bamboo frame of each panel resulting in a beautiful tactile border for the artwork (check out About Project Peace to see the sketch again). ← Welcome to Project Peace!